‘AM:1011’, AndersonMacgee, Limousine Bull, Aberdeen, 21 April – 8 May 2006.
Review first published, ‘a-n’, May 2006. A conspicuous crew of culture consumers stands, temporarily of course, in a typically earthy Torry pub, contra-socially gazing out of the window. Outside, seen through frosted glass, is Bryony Anderson. 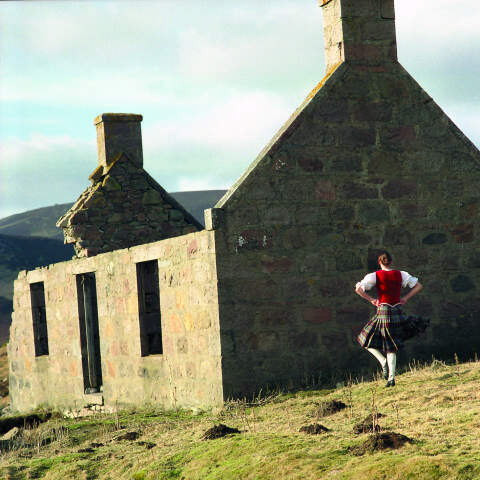 In requisite tartan-alia, she performs an out-of-focus Highland dance accompanied from across the road by a musician who bagpipes Bowie’s ‘All The Young Dudes’. Later, back at the gallery of artists’ collective Limousine Bull, we see a Peacock Visual Arts-produced film of Anderson dancing again, inspired by the locations and the look of select paintings by Landseer. Adjacent, five glassed picture frames hang from the ceiling. They contain subtly coloured fabrics, props from the film, colour notes direct from Landseer’s canvases. Also, laid out on a ledge, five immaculate copies of an immaculate artist’s book. Edited by Jack Mottram, the publication masquerades as a simple record of the film, but critical documentation by Alex Kennedy of the function of documentation confirms that the book opens more than it closes. This two-year long project, of which this exhibition is a notional summary, addresses the construction of cultural identity with an emphasis on cultural stigma, we’re told. But that theme reads here like an expedient, a ready-made identity for the culture circuit. This is more significantly a show about showing and seeing, an incisive exposé of the accultured look and looking of the art world, of the way in which arty gazes are often misdirected and misled, and easily so. What should be a conceptually straightforward arrangement of non-site records of dances on identity becomes, for the better, a weird non-exhibition, but superbly so, one that deliberately relegates itself beneath the fuzzy memory of Anderson dancing on the night – that’s if you were there to see it, dude. In fact, notwithstanding the effective gallery installations, you have an unnerving and rewarding sense that the art here remains tantalisingly on the other side of the window pane, going about its merry dance, while we still congregate in here to look for it.